Arts organisations caught in the olde world? Everyone has examples of pointless links embedded in confirmation emails and yesterday I had a new one. 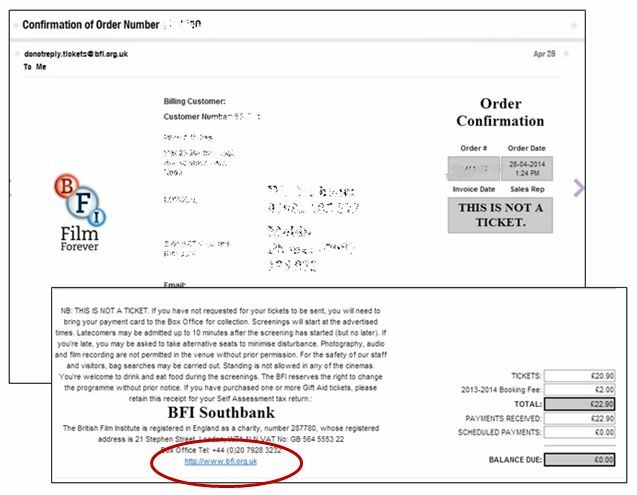 I needed a copy of the confirmation for a BFI film screening, expecting the email to contain the link to take me to my account. I searched all the drop down menus where I was encouraged to sign up to this and that. But absolutely NO signpost to an existing customer’s account area. I found this arrogant. This high-profile organisation’s marketing strategy is lost in the old days where getting the sale is the most important thing. Everything else is secondary. The biggest challenge in e-commerce is to get the first order. Don’t blow it thereafter. Treating customers well after they place their initial order will vastly increase the probability that they’ll place more orders in the future. …. and there was the login link. In the time it had taken me to work that out, I’d been made feel like a second thought. It’s a matter of principle. Neither of these organisations leave me with a warm and fuzzy feeling that I would want to spent my money with them again. Do they think that because they have the great and exclusive discounts and offers they do, that is enough to make customers return? On the plus side, I know that if I do, I now know where my account pages are hidden. It’s an old lesson: It’s much easier to close additional sales with existing customers than to acquire new customers. People who’ve proven willing to give you money will often give you more. This is true for all sales channels, but it’s particularly crucial for e-commerce because the first order proves your credibility if you effectively handle follow-up and delivery. This entry was posted in observance by ad. Bookmark the permalink.